Thanks for submitting @ goldrynn! Did you know that puffins are actually kind of the worst at flying? Once they’re in the air, they’re fine, but if you watch one try to take off, they’re trying so hard and going flapflapflapflapflap and don’t go very far. And sometimes they just kind of give up and dive instead because they’re good at that. But they’re trying their best. So in Witless Bay, Canada, is one of the largest puffin colonies in the world. When fledgling puffins learn to fly, they are supposed to follow the moon out to sea. But the town has an issue with baby puffins getting confused by the lights of the town and flying into town instead! 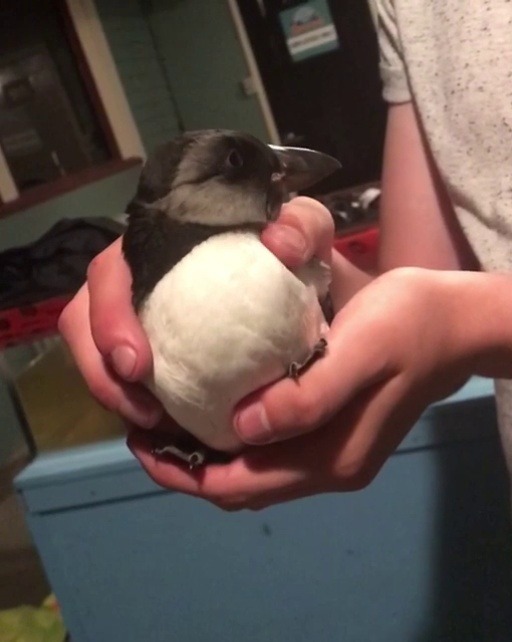 So, in addition to figuring out how to make changes to the lights, groups of volunteers go out at night to rescue puffins! This is Roland. I spotted him and my sister caught him (according to the directions of the organization) and we brought him back to the rescue! We were so excited and love him! Tomorrow he will be banded and released back into the wild!